Nestled right in the heart of the charming and quaint little downtown of Travelers Rest, SC, The Grove at Upcountry Provisions offers an incredibly unique venue space for your next event! The Grove features a "soft-developed" landscape that feels as though one were out in the woods. This rustic environment allows guests to be at their most relaxed state of mind, while actively re-engaging them with nature through the use of natural building materials in the spaces created throughout the property. Every Friday night, enjoy live music and heavy hors d'oeuvres from our rotating tapas menu, and sample from our selection of craft beer and wine. 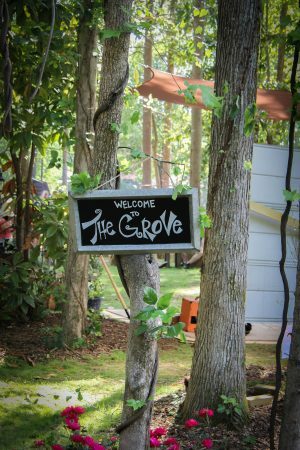 The Grove is also available for private party rental for wedding receptions, birthday parties, and corporate events. For more information, please email TheGrove@UpcountryProvisions.com.